The Japanese Space Exploration Agency's Hayabusa2 spacecraft arrived at 162173 Ryugu in June last year, followed a few months later by NASA's OSIRIS-REx mission reaching asteroid 101955 Bennu. The spacecraft have since spent their time investigating the asteroids to understand their landscape, shape, age, composition and spin. The two projects are not in competition but actively share information and data to help one another. Researchers from both teams are comparing their asteroids to learn even more than would be possible if they could only probe one. 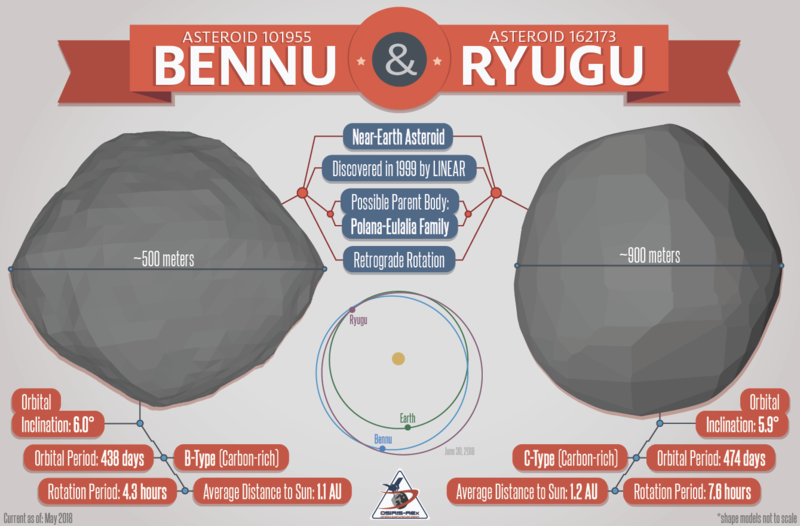 Although alike in most ways, Bennu and Ryugu differ significantly in some areas. Analyses have been presented this week at the Lunar and Planetary Science Conference in Texas, and published in Science and Nature journals. After almost a year surveying Ryugu, the Hayabusa2 spacecraft has already collected invaluable data. “Just a few months after we received the first data, we have already made some tantalizing discoveries,” Professor Seiji Sugita, a researcher from the University of Tokyo, said. 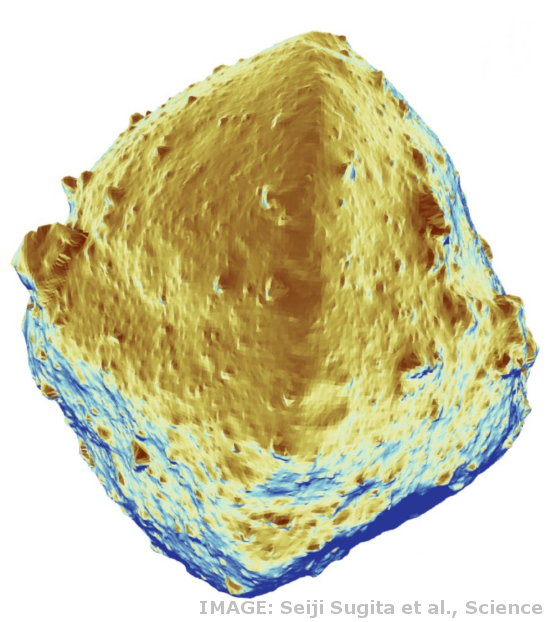 The new data also shows that Ryugu has an oblate “spinning top” shape, which suggests that the rocky body may have once spun at twice its current rate. The asteroid Bennu, which NASA's OSIRIS-REx mission is exploring, also has a “spinning top” shape, and is home to abundant hydrated minerals— much more than Ryugu harbors. The experts are even working on a theory that the asteroids are related, born from a parent asteroid several tens of kilometres wide, most likely in the asteroid families Polana or Eulalia. “Thanks to the parallel missions of Hayabusa2 and OSIRIS-REx, we can finally address the question of how these two asteroids came to be,” Prof Sugita said.